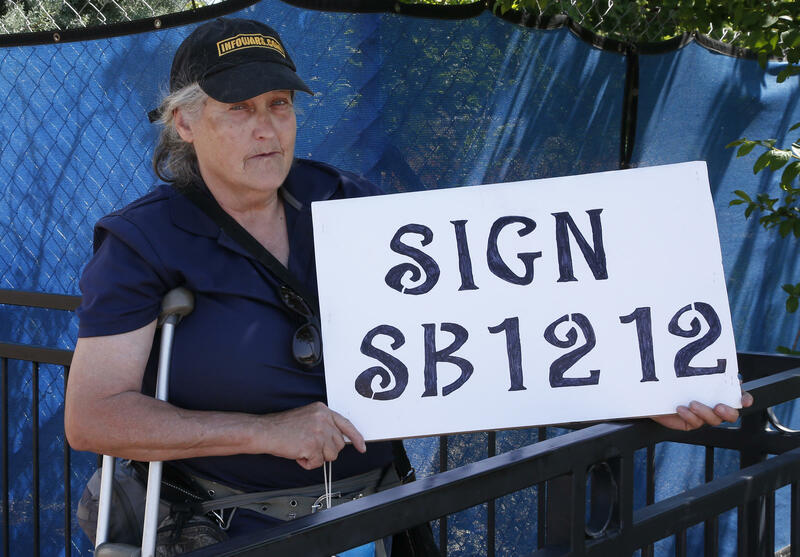 Kathy Renbarger, of Seminole, Okla., holds a sign urging Gov. Mary Ballin to sign SG1212, one of two gun-related bills vetoed by the governor following the 2018 legislative session. Listen to the full episode of Capitol Insider from May 25, 2018. Pryor: Shawn, in most years the legislative session would be ending right about now. But this year it ended early and already plans are underway for next session. Ashley: Yes, it seems rather surprising we're just at the point where the 56th legislature would be coming to its constitutionally mandated end, and the next Senate President pro tem., Senator Greg Treat who is Pro Tem. designate, announced that he is appointing Kim David, the former chair of the Senate Appropriations Committee to be his majority floor leader to take his old job and Senator Roger Thompson to assume Senator David's former position as head of the Senate Appropriations Committee. Senator Treat joked about his penchant for diving into spreadsheets and things of that nature. .
Ashley: Already Senator Thompson is beginning to work on on next year's finances. He plans to learn the state accounting system. He's going through the same training that state agency budget people go through, and he's already calling in the big agencies to meet with him and walk them through his their budget. .
Pryor: All Right. Good for him. A developing story is the Veto Referendum it sounds a little mundane, but it's actually a potentially big story. What is the Veto Referendum all about? Ashley: Well this is something we've not seen in in quite some time. The Oklahoma Constitution allows the people to circulate a petition to put any laws approved by the legislature to a vote of the people. The people could approve them or they could disapprove them-- they could veto them. What we have in this case is the group Oklahoma Taxpayers Unite, a group that is for limited taxes and involves former U.S. Senator Tom Coburn, is circulating a petition to put House Bill 1010 Double X, the revenue raising measure that was approved during the second special session, to a vote of the people perhaps on the November ballot. In order to do that they need to get over 41,000 signatures and they're circulating petitions across the state in order to do that. Pryor: How Are they gathering the signatures and are they going to run into problems with it? Ashley: Well that does seem to be an issue. This week what we have learned is that some of these petitions were being left at a number of businesses across the state, and generally that is not how you circulate a petition.A petitioner has to sign off on those petitions saying that they saw you or I sign the petition and that everything was done according to law. Simply leaving it at a business may raise some concerns in that regard. .
Ashley: Also There is a group out there called Declined To Sign, which has taken note of the various businesses where these petitions were being left and is encouraging people to boycott those businesses and support House Bill 1010 remaining in place. Pryor: Somewhat lost in the last several days was Governor Fallin's first pocket veto of her administration. It came on House Bill 1608, which involves allowing law enforcement to use their own rifles and shotguns. How does the pocket veto work? Ashley: What happens is after the legislature adjourns sine die the governor has 15 days to sign or veto those bills which were put on the governor's desk in the final five days of the legislative session. If the governor does not take specific action on a bill it is considered disapproved. That's the pocket veto. In this case, Governor Fallin did not act on the bill at all. So on midnight on May 18th the bill was disapproved, although it had been approved by both chambers of the legislature. .
Pryor: And What's the significance of the pocket veto? Ashley: Well with a regular veto-- a bill that a governor affirmatively vetoes-- the governor is required to issue a message explaining the purpose of that veto. With a pocket veto, the governor doesn't do that. So we don't know in this case exactly why Governor Fallin allowed this bill to fall by the wayside and be disapproved. Pryor: Interesting Because she had affirmatively vetoed the permitless carry bill. .
Pryor: That's right-- Senate Bill 1212. This was also a handgun bill or a gun bill. But she chose to let it fall to the wayside. Ashley: Now we are about a month away from the primary election on June 26 which also includes state question 788 medical marijuana legalization issue. We'll be discussing that question soon. .